Samford Arts is presenting three guest performances on campus over the next 10 days, including two sponsored by School of the Arts and one as part of the Wright Center’s Signature Series. Organist Joyce Jones will be performing Sunday, Oct. 26 at 2:30 p.m. in Reid Chapel. Jones is the only organist to win the prestigious G.B. Dealey award, and she has several other groundbreaking accomplishments. She was the first woman to perform on the organ in the historic Crystal Cathedral in suburban Los Angeles and was the first organist invited to play at the Grand Teton Music Festival. She retired from the Baylor University faculty in 2012. Performing around the world, Jones has remained committed to making friends for the organ, and sharing her testimony through music. The Tsai Family will perform at Samford Tuesday, Oct. 28, at 7:30 p.m. in Brock Recital Hall. Jason and Fang Tsai have five children, who have all been involved in music from an early age. Their daughter, Elizabeth Tsai, has studied piano with Samford professor Ronald Shinn and has won several competitions. Her brother, Eric Tsai, is an accomplished violinist whose many achievements include performing on Christopher O’Riley’s nationally-syndicated radio program. The family has moved from the Birmingham area but is returning to perform on Tuesday. “For the past decade, we have been fortunate to claim the extraordinary Tsai family as part of the Samford and Birmingham community. This remarkable family studied with our faculty and won national attention,” said Joseph Hopkins, School of the Arts dean. Both School of the Arts-sponsored performances are free. 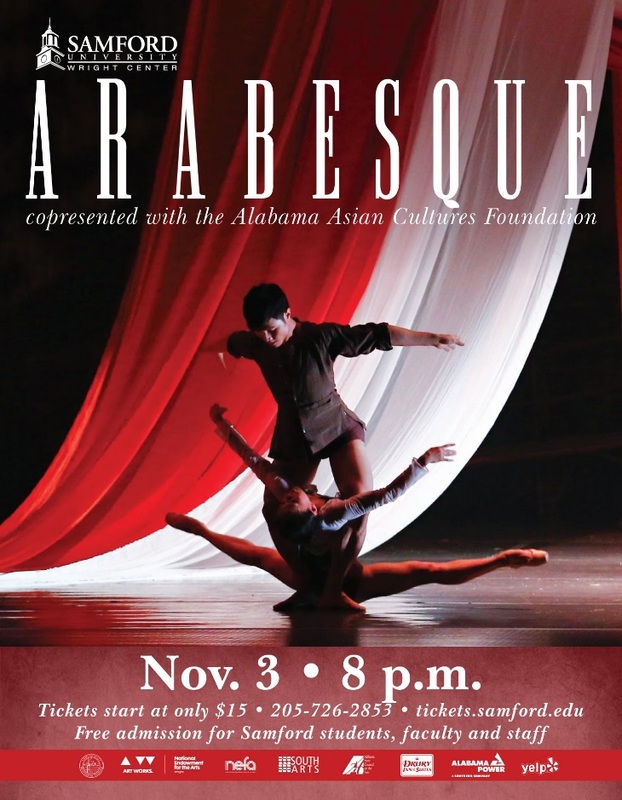 The Signature Series will present Arabesque Monday, Nov. 3 at 8 p.m., in the Wright Center Concert Hall in partnership with the Alabama Asian Cultures Foundation. The dance company will perform their signature work The Mist, which premiered in 2011 in Ho Chi Minh City, Vietnam. Tickets begin at $15 and are free for Samford employees and students. Through “The Mist”, the company echoes the gradual change in Vietnam itself, bringing creative expression to explore the history, traditions and aesthetics of their home country, according to Sean Wright, Wright Center and Signature Series director. A mix of ballet, modern dance and traditional Asian movement, it celebrates the daily life and rituals of Vietnam. The evening performance will be the culmination of four days of residency which includes multiple master classes, community forums and open lectures across the Birmingham metro area, according to Wright. The presentation of Arabesque is part of the CenterStage SM, an initiative of the U.S. State Department’s Bureau of Educational and Cultural Affairs. The tour also is administered by the New England Foundation for the arts and supported by the Alabama State Council on the Arts and the National Endowment for the Arts. Includes reporting by Emily Duval, a journalism and mass communication major and a news and feature writer in the Office of Marketing and Communication.